Rollerball pen fans have long appreciated this true classic that has been a favorite pen for decades! The uni-ball Roller pen writes as smooth as a fountain pen, but without the mess. 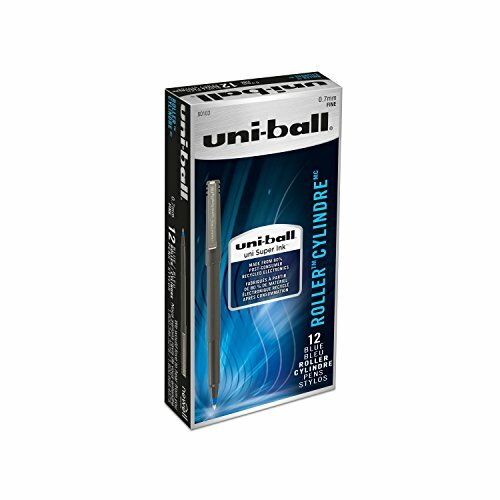 With an attractive, black matte finish and a durable metal clip, the uni-ball rollerball pen is a pen you can rely on! This reliable pen is also made from 80% post-consumer recycled electronics. Like all uni-ball pens, the Roller pen features uni Super Ink which protects against water, fading and fraud. This pigment based ink contains particles that form an indelible bond in paper- it can’t be broken...ever. If you have any questions about this product by Uni-ball, contact us by completing and submitting the form below. If you are looking for a specif part number, please include it with your message.